Dense Phase Conveying - Can You Give Me A Boost? Sometimes we all need a little help to get where we are going. 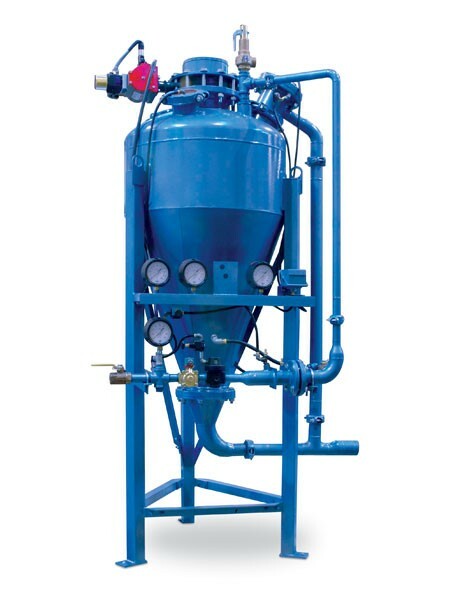 Dense Phase, in pneumatic conveying, is essentially a way of saying we are moving the product slowly and at high material-to-air ratios (lbs. of material to lbs. of air in a given cross sectional area of pipe). The most common reason for wanting to do so is to help fight abrasion. Either abrasion of the product because it is “friable” (aka breaks or chips easy), or abrasion of the equipment (think silica sand, where otherwise you are sandblasting your pipe from the inside out). The key to being able to do this well for any company is the air management system. These systems come in different styles of operations. One of the most common methods is to use additional boosters to add additional air to the convey line “when needed”. One teensy little problem with that: When you are trying to reduce the air volume of a system to make it run slower, do you really want to add more air? That’s like trying to make a car more fuel efficient by adding a bigger Horsepower engine. The heart of Smoot’s dense phase system, by contrast, is not a series of “boosters”, that you need to: install, power & maintain, but rather a high pressure mechanical diaphragm called a By-Pass Valve. Rather than increase the airflow through a system, the By-Pass valve brings a system’s M/A ratio back into balance by bypassing air around the Pressure Vessel and into the convey line, restricting material instead of increasing air (which speeds the system up and consumes additional plant air). By keeping additional air out, it allows you to continue to operate at low velocities throughout the conveying cycle. For more information on Dense Phase Systems Click here.